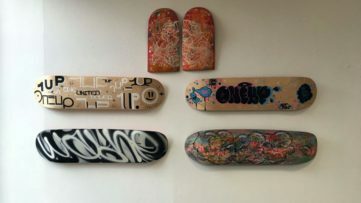 The Open Walls Gallery based in Berlin and known for its unique and transient nature in creating pop-up shows and its support of urban fine arts, has announced an interactive installation by Madrid born street artist Aïda Gómez titled Joy is Here. The Open Walls Gallery,(that has presented exhibitions such as Paper Works that included artists Anton Unai, BLO and Paola Delfin and the fascinating concept of the Positions exhibition) operating mainly out of Stattbad, a vacant swimming pool in the northern part of Berlin represents a number of local street artists and works with the idea of giving those involved with street art a voice in the world of fine art. 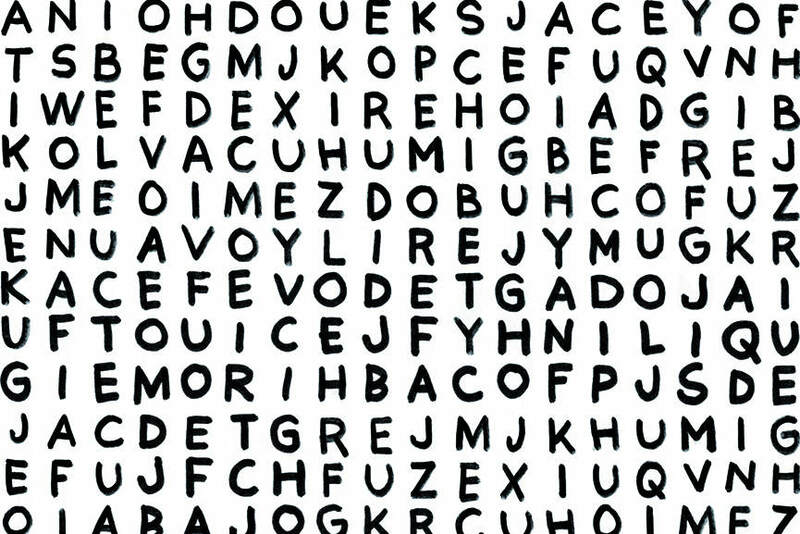 Spanish street artist Aïda Gómez will be creating an interactive installation for her Joy is Here show for the Open Walls Gallery in Berlin, that will take the form of a massive word search game (you can watch the Words Alive video about the visual word puzzles by SpY in Mexico). For the interactive installation, street artist Aïda Gómez has responded to the day known as Blue Monday that occurs on the Monday of the last full week of January and is purported to be the most depressing day of the year (have a read about the Biography show by Danish-Norwegian art duo Elmgreen and Dragset that touches on seasonal depression), and decided to create her massive word searches that will be situated in and around Stattbad so that people can briefly forget the world as it is and get lost in her sea of letters. 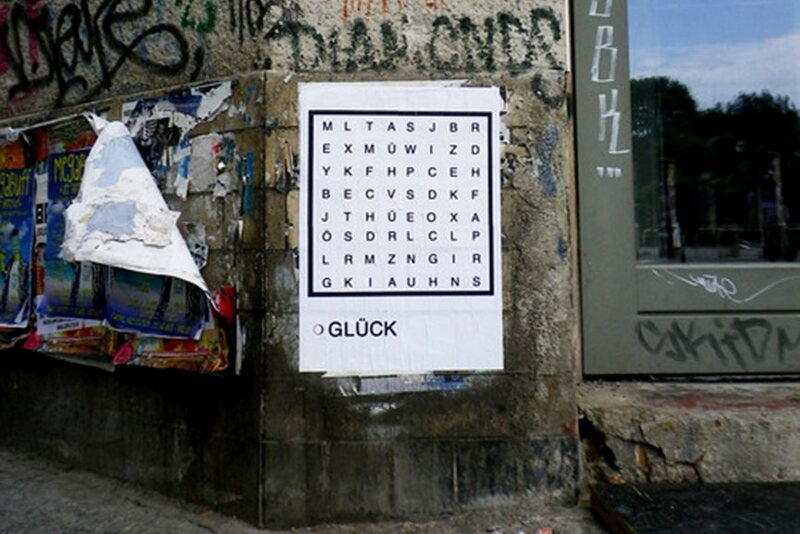 Aïda Gómez has produced similar interactive installations before, as with her GLÜCK (which means happiness and luck) word search paste ups in Berlin, 2012 (here is a video about LA based art collective Cyrcle who created interactive puzzles for their solo show Organized Chaos) where the street artist tries to let go of the idea of happiness as a response to emotions but find joy by playing and losing yourself away from thoughts of the world. 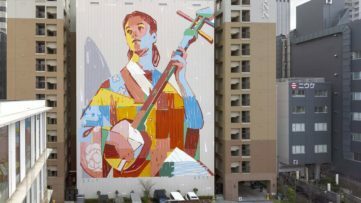 Street artist Aïda Gómez was born in Madrid, Spain, 1986. 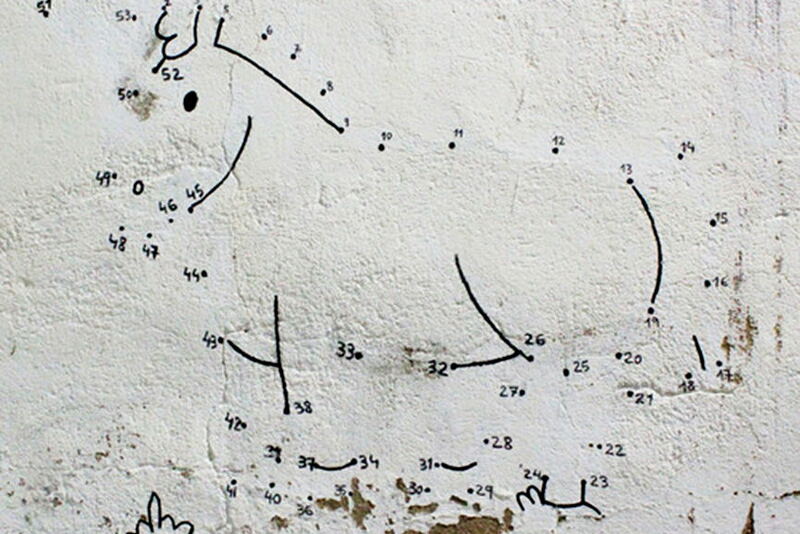 Between 2006 and 2011 Aïda Gómez worked as part of the La Pluma Eléctri*k street art collective working on projects such as Spider Tag and Unexpected Gallery and came to view the streets as her playground, using unusual techniques and what the artist terms non-violent materials to reveal hidden treasures. This includes pieces such as Home Is Where Your Heart Is, a series of cross stitched hearts on street fences, using techniques her aunt taught her as a child (you can read here about the I haven’t a Single Explorer on My Planet exhibition by guerrilla knitting activist Olek, known for yarn bombing a fence in New York and Katowice Prison in Poland) and her Dot to Dot street works for the Festival de Arte Emergente de Cuenca Extendio in 2013, that required the public to participate by finishing the drawings (You can view the Marina Abramovic Sleeping Exercise video that also involved the public becoming actively involved with the work to complete it). The Joy is Here active installation in Berlin is an opportunity to go forget about the world and to go and play out on the streets and perhaps relive some of that enjoyment you felt when discovering the world as a child. 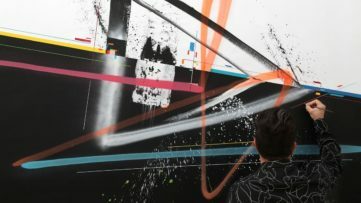 The interactive installation Joy is Here by Aïda Gómez will be at the Open Walls Gallery in Berlin between 24th January and 7th February 2015. Opening times Wednesday to Saturday 13:00 to 19:00 and also by appointment. Come and find some joy by signing up to My Widewalls today! 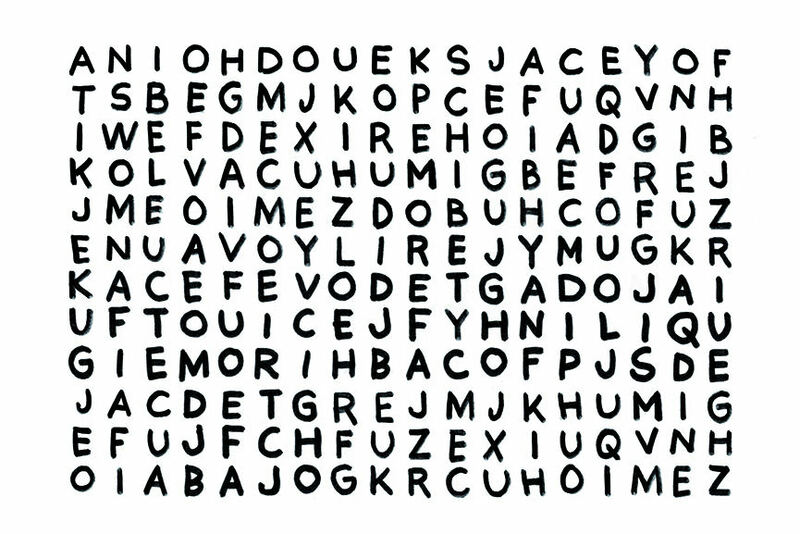 Aïda Gómez – Joy Is Here Wordsearch Game, 2015. Bottom three images for illustrative purposes only. 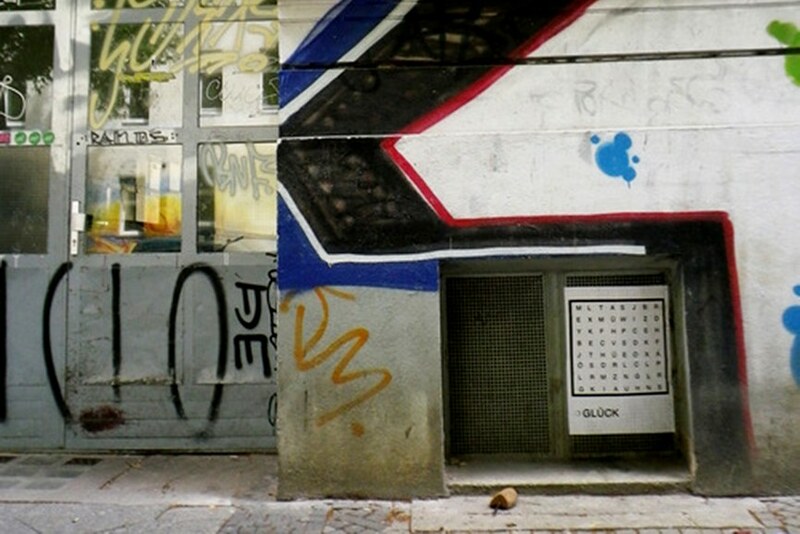 Images courtesy of Open Walls Gallery and Aïda Gómez.